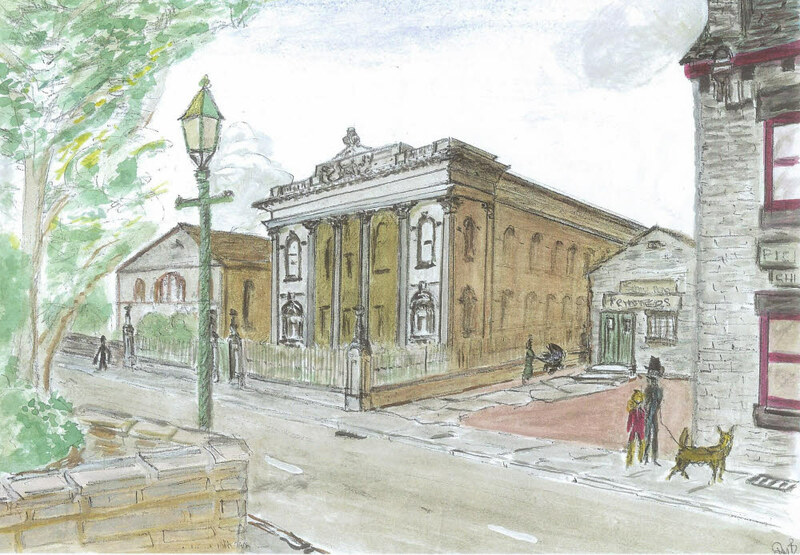 The Wesleyan Chapel on Wesley Street was built between 1866-68 at the height of religious fervour in Ossett. It was said to be the third largest Methodist chapel in England. The chapel had a fine classical facade, which faced out on to Wesley Street with the other three sides having a rather plain appearance. The Wesleyan Sunday School built in 1825 can be seen beyond the Chapel. The chapel was demolished in 1961. On the left of the sketch is the wall of Jagger’s Croft and on the near right the building, known today as Rhythm & Booze, was then Pickard’s Chemist’s (later run by a Pickard descendant, Ian Rigg). Between the Wesleyan Chapel and Pickard’s Chemist is the Shaw Peace printing works, which was located in the old Church of England Sunday School building which was built in 1814 at the end of Old Church Street. The old Back Lane (now, at this point, Ventnor Way), marked by the position of the lamppost, ran along the front of the Jagger’s Croft wall and between Shaw Peace and Pickard’s Chemist.